SAN DIEGO, Calif. /California Newswire/ — Consumer Advocates for RCFE Reform (CARR) is pleased to welcome Ms. Susan Valoff as its newest member of the Board of Directors. Ms. Valoff was installed in this role at the organization’s last board meeting on 14 November 2018. Ms. Valoff is an owner and Vice President of Windward Life Care (formerly Elder Care Guides), with over 20 years’ experience working in clinical settings serving older and disabled adults. She is a graduate of Brown University and earned her Master of Social Work from the University of Chicago. Her extensive background working as a Licensed Clinical Social Worker (LCSW), and as a certified Aging Life Care Manager make her particularly well-suited to participate in the governance of the organization. She sits on San Diego County’s Aging & Independence Services Advisory Council and is a member of several national organizations. Her broad set of skills and knowledge of the elder care industry will add depth and insight to CARR’s advocacy issues and serve to make the board’s collective experience more diverse, better positioning CARR to serve an increasingly heterogeneous aging population. Ms. Valoff replaces the vacancy left by the resignation of former board member Judith Wenker, Esq; we extend our sincere appreciation to Judy for her many contributions to CARR’s growth over the span of her term. With the addition of Ms. Valoff, CARR moves into 2019 with a full board including Dr. Joaquin Anguera, California Commission on Aging, Col. Richard Shigley, USMC/Ret., and Ms. Cindy Hasz, Geriatric Care Manager and President of Grace Care Management. 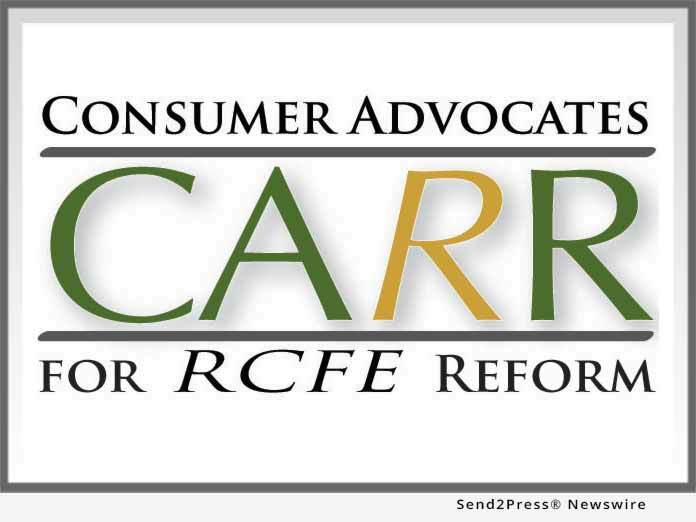 Consumer Advocates for RCFE Reform (CARR) is a San Diego-based 501(c)(3) not-for-profit public benefit corporation that is the only statewide organization dedicated exclusively to assisted living research, education and consumer advocacy. Consumer Advocates for RCFE Reform (CARR), P O Box 82123, San Diego, CA 92138.